SOLD! 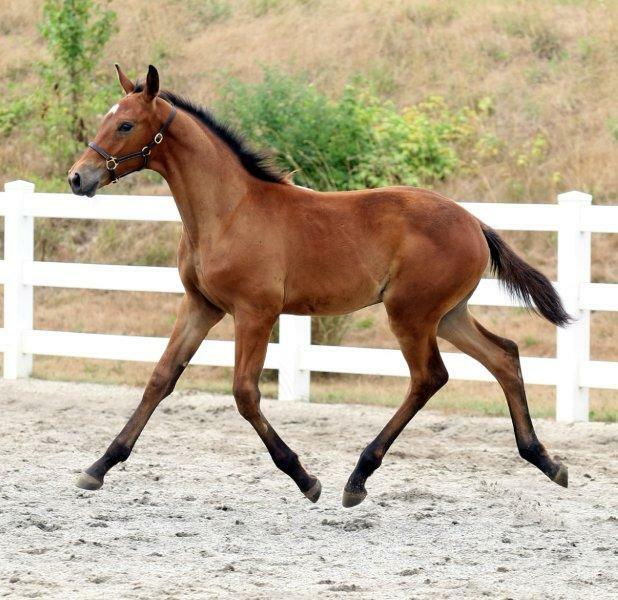 Congratulations to Ellen Kvinta Palmisano of Redding, CT on owning this unborn Gold Luck foal! 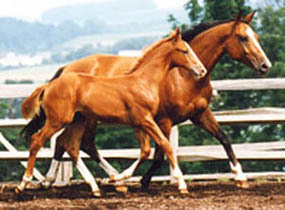 Alure was the top HN mare at the PA inspection in 1994. She received a score of 7.0, making her Elite Eligible. She was wonderful to ride. She has never been performance tested. 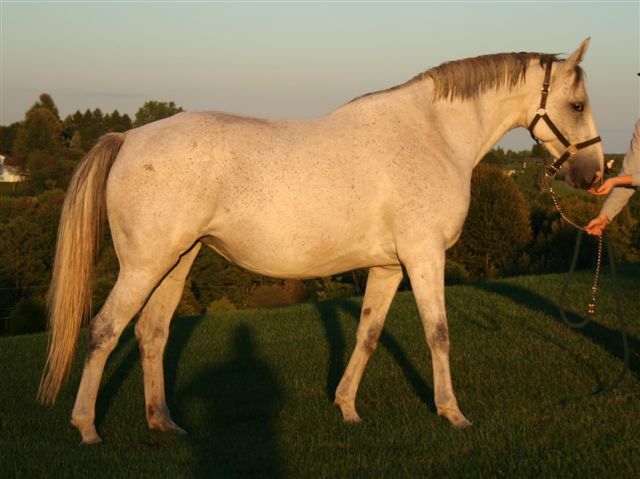 Instead, she has been a steady producer of top foals, and is one of my favorite mares to cross with Gold Luck. SOLD! Congratulations to Ellen Kvinta Palmisano of Redding, CT! Anike's sire is Archipel, a son of Argentan, who passed the stallion Performance test at Adelheidsdorf in 1988, finishing 5th of 38, achieving equally good results for rideability and for jumping ability. 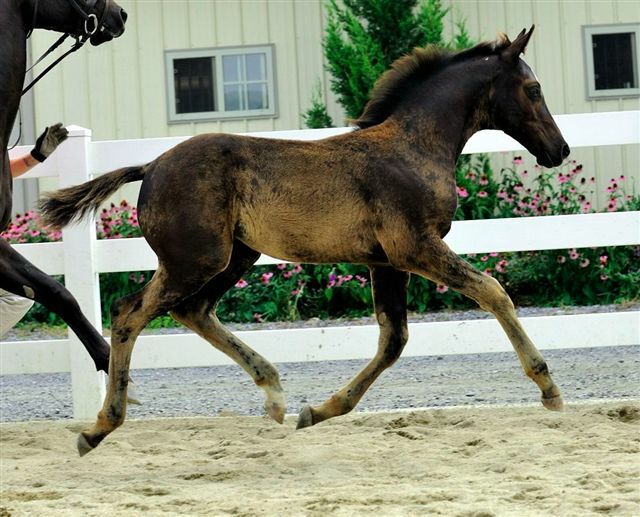 EM Dew Berry has been unable to carry a pregnancy to term for 3 years now, so she has been started again under saddle and is available for sale. She is going great under saddle, and has taken to it like no time has passed since the last time she was ridden as a 3 year old. She is still a really fantastic mover. SOLD! 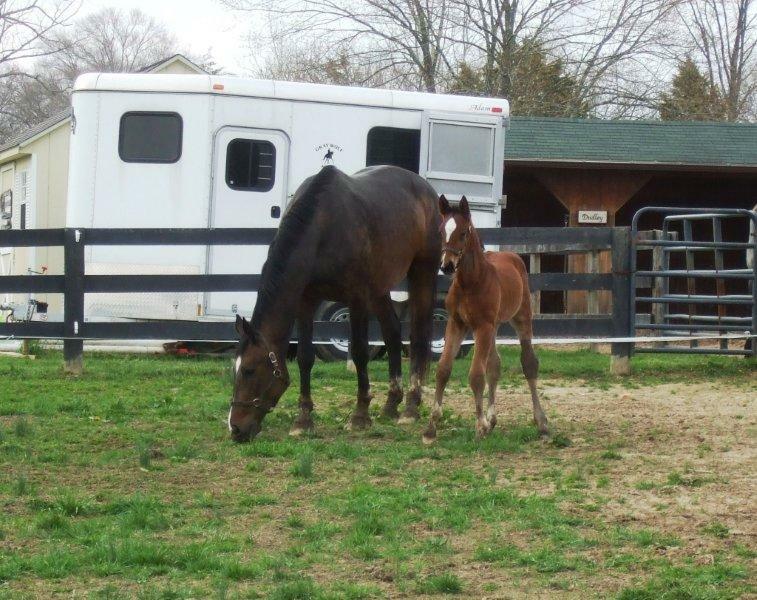 Congratulations to Ellen Kvinta Palmisano of Redding, CT who owns this unborn foal by Gold Luck! Congratulations to Jennifer Mutchler who loved riding Ghalleon and Ghulliver so much that she bought their full brother Ghoodfella and the dam, too! Birth report: I was away until Monday scribing at the Palm Beach Dressage Derby in FL. 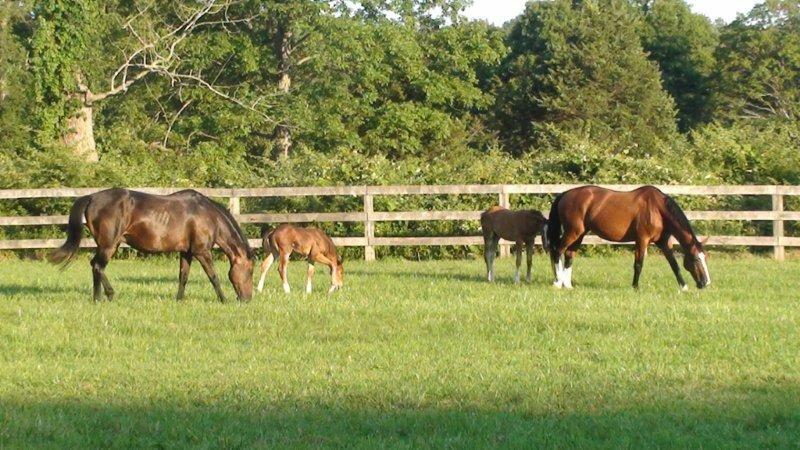 It was so nice of Chita to wait until I returned to have her foal. 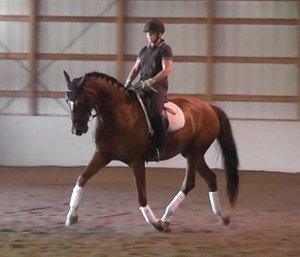 He is very tall and substantial and looks a lot like Ghalleon and Ghulliver did at this age. I'll post more photos when he has unfolded. This one is from Quinnton's cell phone. SOLD! Congratualtions to Jennifer Mutchler of VA! Hhamilton has been a winner in the dressage ring and has been to a three day show where he behaved like an older schooled horse. SOLD! Congratulations to FEI rider, Marie Richards! Lharamie is as sweet as can be. He moves with grace and rhythm. 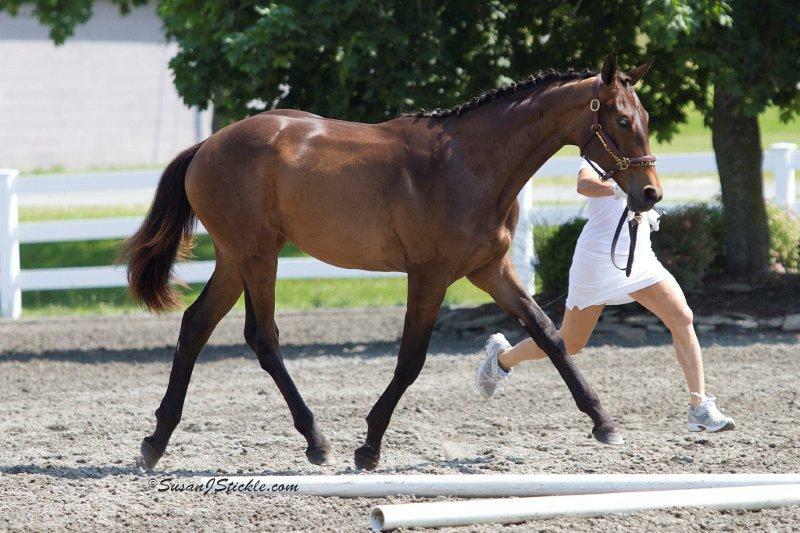 He didn't show his trot much at the GOV inspection- a pity, since I think he is a good mover. SOLD! Congratulations to Tonya Kuizengaof Auburn, MI! Too late to buy him for a bargain price! I have raised his price to what it should be, since he has outgrown the geeky look he had as a foal, and now you can hardly tell him apart from Lhollipop. 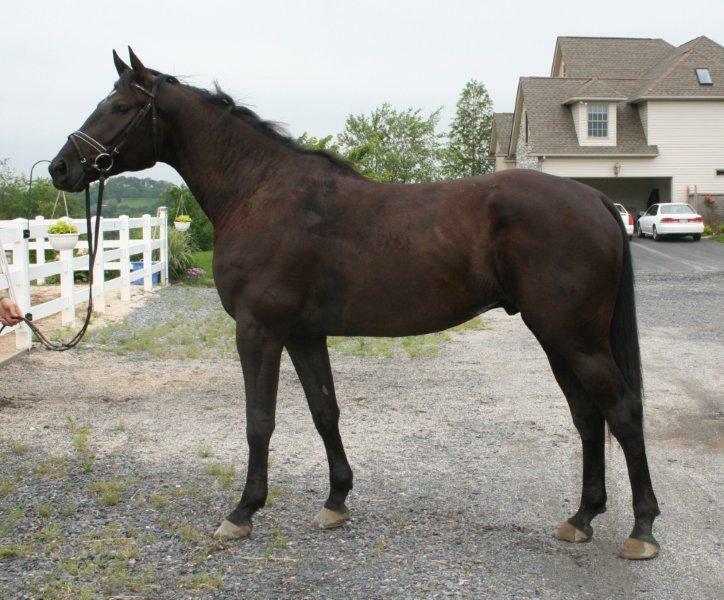 A real find!It was a total fluke to find this very nice mare (long story...). She is very correct and is by the very successfukl FEI dressage stallion, Pik L. This year, he was the reserve horse for the US Pan Am team. Penny Lane RSF was inspected and placed into the AHS main Studbook with very good scores. 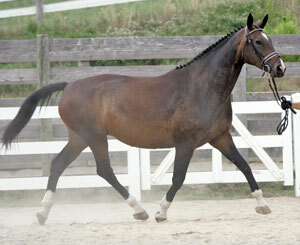 In 2008, Penny was inspected and placed into the main studbook of the GOV. Iris called to tell me about this colt being born. She says he is tall and a really good one. Iris' father has seen him and declared him to be a really good colt, and he has raised and sold many stallions. I can't wait to see photos, and find out what name they will give him. SOLD! Congratulations to Udo and Iris Borchers in Germany! Shane looks better and better every day, and he is a real sweetheart. SOLD! Congratulations to Quinnten Alston! 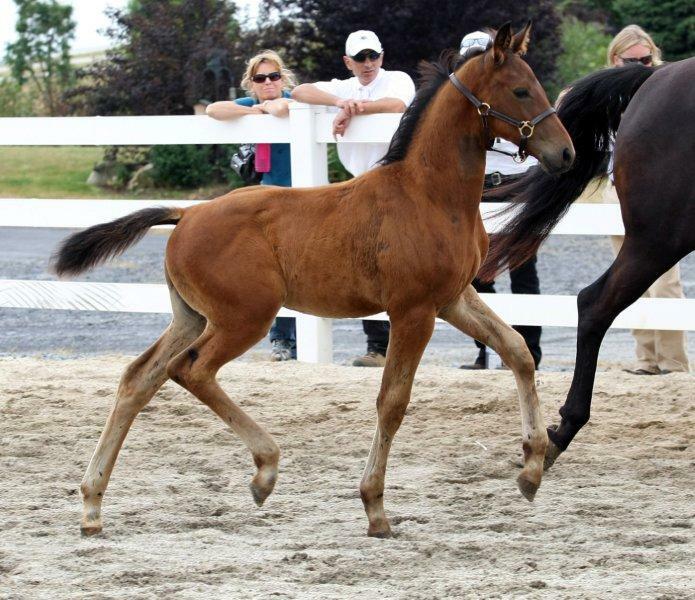 Shayonara didn't let her young age at the time of the inspection stop her from strutting her stuff. 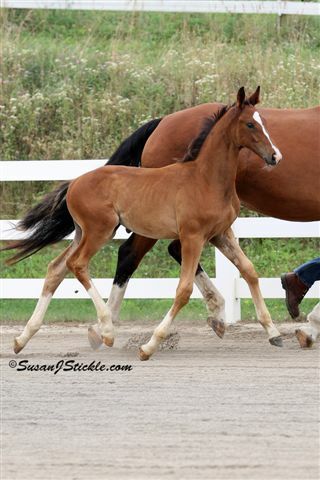 Look at that trot! 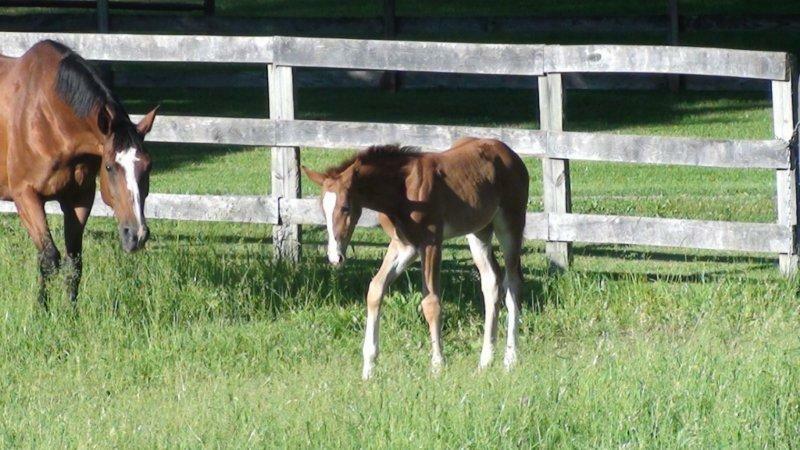 We anxiously awaited the birth of this foal. One, because it was our last one due, and two, because of the great success and reputation of his sire, Sir Donnerhall. This colt does not disappoint us. He is personable, and what a mover! Wow is all I can say about this colt's movement. 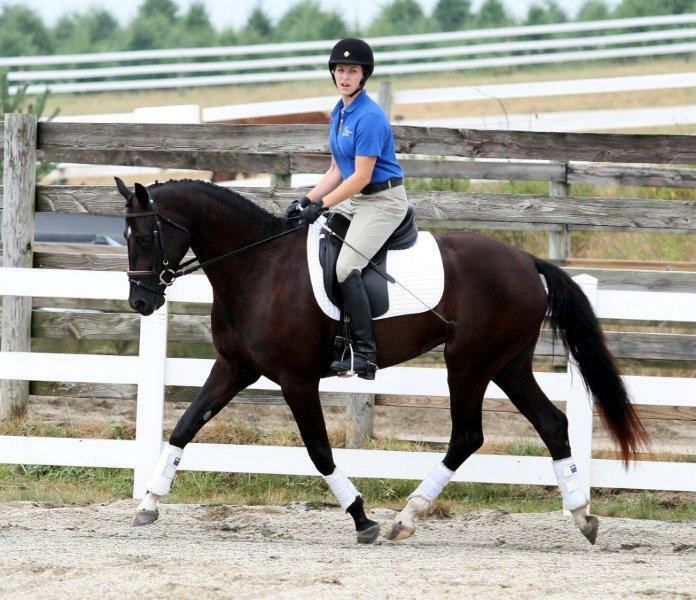 He's a perfect prospect for the FEI ring. SOLD! Congratulations to Nikki Serge of NJ! She was getting a little geeky for this video session, but I saw top movement a few weeks ago and her conformation is beautiful. 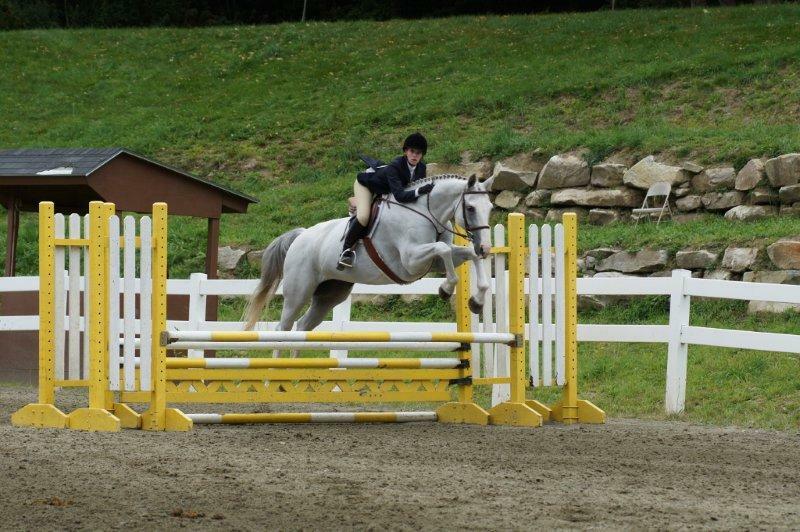 Her half brother named Fhinancier won the Young Hunter Under Saddle at Devon this year. He is tall, very correct, and he can really move! SOLD! Congratulations to Olav Drehn of Stanfordville, NY! 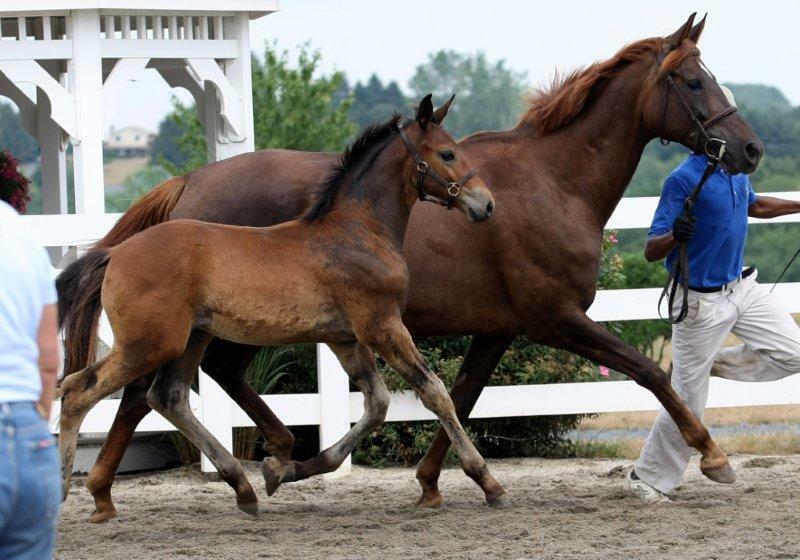 By Waltzertraum, who was Grand Champion at Raleigh , champion Hanoverian at PVDA, Lexington, and NCDCTA Breed Shows and reserve champion at the Lexington breed show. 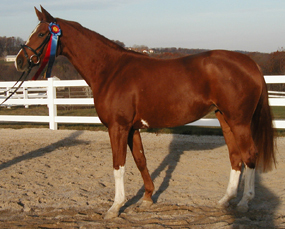 At Devon, he was reserve champion young horse. 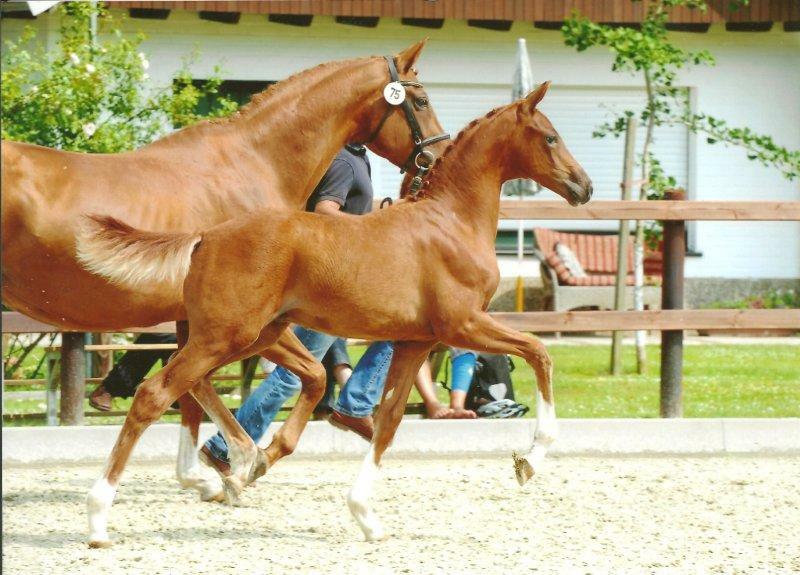 He obtained his breeding license through performance scores at the PSG level. SOLD! Congratrs to Jennifer Mutchler of VA! Whitesinvogue was purchase in fall of 2004. She was inspected at the Hedgeland Farm inspection. 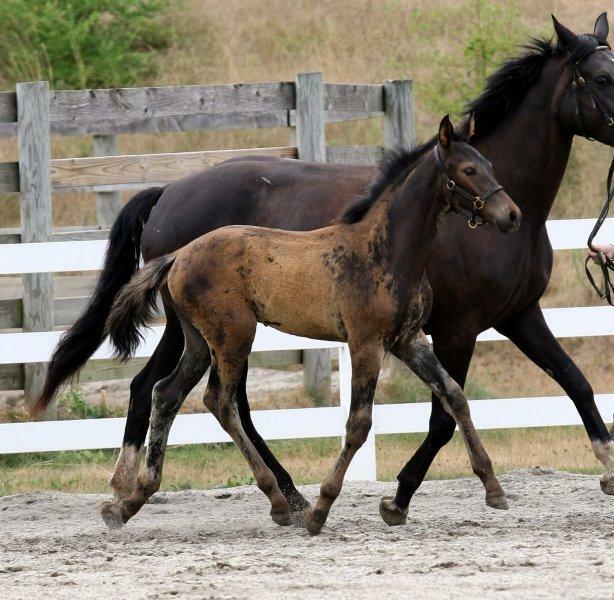 She received an overall score of 7.33 with 8's given for head, foreleg, typiness and femininity, walk, and impulsion and elasticity at the trot. 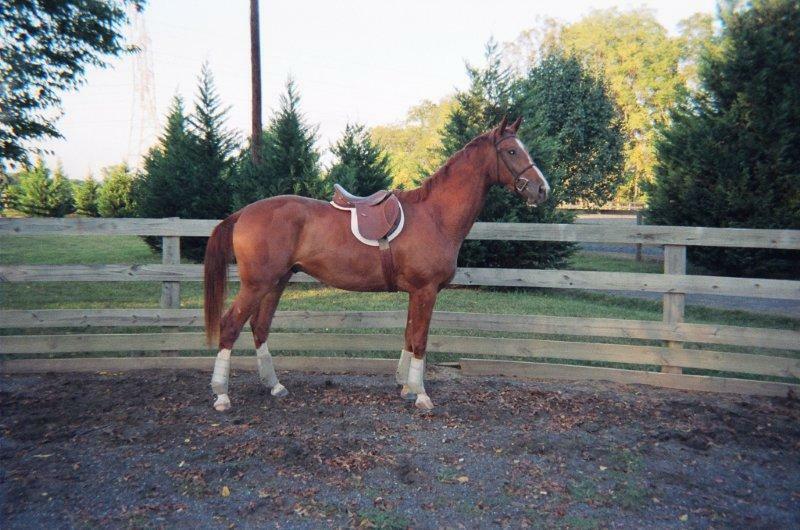 At that same time she participated in the Mid Atlantic Hanoverian Breeders Club Mare Show where she won her three year old fillies class, and was named champion young mare with a final score of 7.8, and a 1A premium. 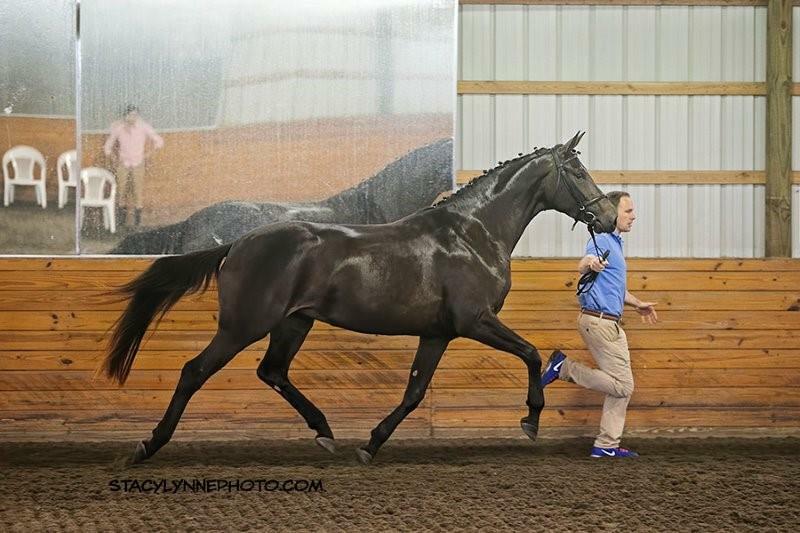 Gerd Zuther states in The American Hanoverian magazine,"This was a very impressive filly: her trot movement was lovely, ground covering with lots of suspension. For the trot she received the well deserved score of 8.5, for her rhythmical walk she received a 7.4."